Our expedition starts in Punta Arenas, Chile, with its distinctive European flavor. Punta Arenas is located 3.5 hours south of Santiago by plane on the Strait of Magellan. The city has a population of 115,000 and is the commercial, cultural, and social hub of the Magellan territory. A short stay in Punta Arenas will allow the members of the expedition to get acquainted with each other and prepare for the trip. Following our visit to Punta Arenas, we will head north to Puerto Natales. On the way, we will explore the Otway Sound Penguin Colony (Seno Otway Pinguinera) home to thousands of burrowing Magellanic penguins. The road continues through the town of Rio Verde, one of the earliest settlements of the region with exquisitely maintained buildings in British style. By day’s end we will reach Puerto Natales, capital of the province of Ultima Esperanza (literally, Last Hope). 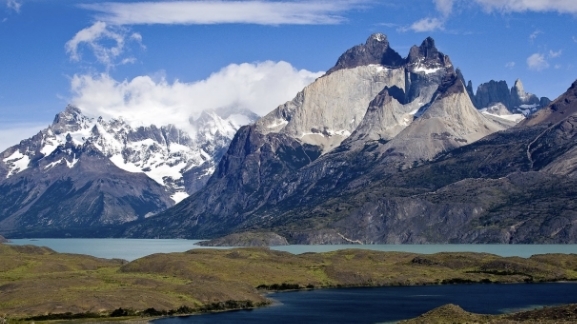 Puerto Natales is the gateway to world famous Torres del Paine National Park. The park was created in 1959 and declared Biosphere Reserve by UNESCO in 1978. The visit to the park is one of the photographic highlights of the trip and well worth venturing to the end of the world. The Paine Mountain Chain is an impressive joint of mountains governed by steep granite towers, the photogenic Cuernos del Paine (Horns of Paine), and the 3,050meter summit of Paine Grande. The mountainous range is crowned by massive glaciers and surrounded by jewel-like lakes. A microclimate supports a rich flora and diverse fauna. We will spend 2 or 3 days taking advantage of outstanding photo opportunities under a wide variety of dramatic lighting conditions. From Puerto Natales, we will also visit the Natural Monument of Milodon Cave. In 1896 animal remains were discovered in the cave. Scientists originally believed the remains to be fresh. However, it was later documented that the remains belonged to a very large herbivore, the milodon, believed to be extinct since the Pleistocene era thousands of years ago. The road now takes us to the Pass of Cerro Castillo, a village and estancia near the border with Argentina. After taking care of the border formalities we head north through the vast and desolate Argentinean Pampa to El Calafate. El Calafate will serve as our base when we visit the massive Ice-Fields of Los Glaciares Nacional Park, one of the most dramatic sites created by nature. Here we will explore Perito Moreno, the most impressive and accessible glacier of the world. Its system of walkways allows us to come almost within touching distance of a cathedral of blue-white ice. The thundering sounds are as amazing as the sight of the glacier's 197ft high ice wall carving chunks of ice into turquoise Lago Argentino. After spending a couple of days in El Calafate, we resume our journey and head to the town of El Chalten, population 200. Argentina's national trekking capital, El Chalten offers easy access to the Fitz-Roy range with its glorious peaks and glacial lakes. The summit of Mount Fitz-Roy is almost always covered with a cloud that the original inhabitants, the Tehuelche, thought was smoke. This misconception gave origin to the name Chalten meaning volcano. From El Chalten, we will travel on rugged Route 40 (La Cuarenta) approximately 400kms to reach the Parque Nacional Perito Moreno. Named after Francisco Moreno, the founder of Argentina's national park system, it is possibly the wildest of Patagonian parks. The intensely colored summits of the Sierra Colorada are the backdrop for the lake-laden and wildlife-rich high country of the park. Guanacos and huemules (Andean deer) graze the summer pastures. The pilquin or chinchillon anaranjado, a species of vizcacha unique to southernmost Chile, is also conspicuous. Local predators include the puma as well as grey and red foxes. Notable birds are the Andean condor, the flightless rhea, the large owl nacurutu, Patagonian woodpeckers, and the carancho. Back on Rte. 40, we head to Bajo Caracoles, a small village 150kms from the park. This rustic village is the springboard for expeditions to Cueva de las Manos, a UNESCO World Heritage Site. The cave’s rock walls are covered by hundreds of stencils of human hands, guanacos, and abstract forms. Some dates back to 7370 BC. Next, we head west toward the Argentinean-Chilean border. On our way, we will pass Lago Posadas and Lago Pueyrredon with their interconnecting and contrasting blue and green waters. We cross the border via Paso Roballo to return to Chilean Patagonia and reach the town of Cochrane. From Cochrane we head south on the Austral Road bordering the Baker River. Traveling through beautiful unexplored landscapes we come across Caleta Tortel, an isolated village with a population of less than 500 inhabitants. The town sits between the fjords and the hills. It was built on steep, rocky slopes over the water and has no streets or fire engine. Access is provided by a 7km-long system of wooden planks. The journey continues through Chile’s fjord region to Puerto Yungay where a short ferry ride to Rio Bravo connects us to the last leg of the trip down the Carretera Austral. One hundred kilometers south we find Villa O’Higgins, the last outpost on the road. Villa O’Higgins, with a population of approximately 400, was accessible only by air taxi or by water until 1999 when the new road finally opened. The town attracts visitors seeking good fishing, trekking, ecotourism, adventure, and rest. It is also the door to the glaciers of the Campo de Hielo Sur, the southern Patagonian icecap. After an overnight stay in Villa O’Higgins, we retrace our steps back to Cochrane and continue north to Puerto Tranquilo on the shores of Lago General Carrera. The area’s best attraction is the Capilla de Marmol, a spectacular string of natural marble grottos carved by the lake’s water. Parque Nacional Queulat with its amazing hanging glacier; Puerto Puyuhuapi, famous for its nearby thermal waters; and Futaleufu ranked among the world’s top 10 whitewater rivers. Reaching Chaiten, our trusty Land Rover gets a break aboard the ferry that will take us to Chiloe. Chiloe is an archipelago of almost 40 islands. Isla Grande (Big Island) is Chiloe’s largest island and the second largest in South America after Tierra del Fuego. Long inhabited by Cunco, Chonos, and Mapuche Indians, Chiloe became part of the Spanish empire in 1567 when the city of Castro was founded. The region was a Jesuist enclave. The Jesuist left their mark with the 50-plus wooden churches scattered around the archipelago. In addition to the churches, palafitos, stilted waterfront houses with elaborately carved shingles also characterize the local architecture. The area provides a variety of entertainment with bicycle tours, adventure excursions, fishing trips, and maritime crossings. The Parque Nacional Chiloe also offers plenty of opportunities to enjoy the local flora and fauna. One more ferry ride will deliver us to our final destination, the city of Puerto Montt, capital of the Tenth Region, (Los Lagos). While in Puerto Montt, we will visit Angelmo port, popular for its handicrafts center and marisquerias (seafood restaurants). We will take time to unwind before catching our flights home.